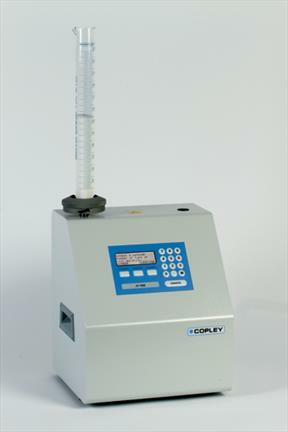 The Tapped Density Testers Series JV have been designed to measure the tapped density (or tap density) of powders, granules and similar products in accordance with USP Chapter <616> Method 2 and Ph.Eur. Chapter 2.9.15. This technique is particularly useful in powder flowability studies and also in determining the amount of settlement during transit to optimise pack sizes e.g., washing powders. Tapped density is achieved by mechanically tapping a measuring cylinder (i.e. raising the cylinder and allowing it to drop a specified distance under its own weight) containing the sample under test. The tapped density in grams per mL can be calculated by dividing the sample weight by the final tapped volume. Measures of the ability of the powder to flow and its compressibility can now be given in the form of the Hausner ratio (Tapped Density/Bulk Density) and the Compressibility Index ((Tapped Density – Bulk Density/Tapped Density) x 100). ISO 9161 (uranium oxide powder).